Get up and running fast and start making ultra-realistic backing tracks easily for your songs today! Eli starts with the general concepts of what this unique software package does, and then walks you through Installation and Setup. From there, Eli starts exploring the Application, the Main Window, and How to Search, Sort, and Load Songs. The next group of videos dives deep into Creating Your Own Songs and Arrangements. Eli covers How to Start a Song; Enter and Edit Chords and Repeats; Rests, Shots, Holds, Pushes, Part Markers, SubStyles, and much more. Eli now discusses how to Customize a Song and Style. You'll learn all about the StylePicker, MultiStyles, MIDI SuperTracks, RealTracks and more. Eli now goes deeper with videos on Working with Tracks, featuring Track & Thru Settings, Melodies & Solos, The Melodist and Notation Basics. Eli concludes the series with videos on How to Save and Export Your Songs, and How to use BIAB in DAW Plug-In Mode. 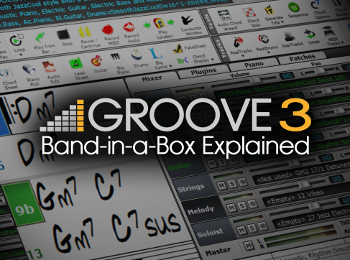 If you're new to Band-in-a-Box®or just want to master it, this series is a must see... Watch "BIAB 2015 for Windows Explained" today!